... and already little Nina is fitting right in! 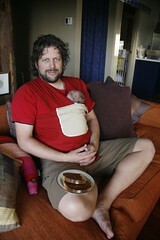 Seen here in her sling while Dad enjoys his morning toast. What an incredible feeling to be able to bring Nina, aka Sprout, into the family. She and I came home from hospital on Monday, and every day has been an adventure, a learning experience, and a total cornucopia of delight. There aren't really the right words to describe the emotions of all this. There's so much wonder in every little detail, from her long legs and big feet (go Phil's tall genes! ), to the silky hair on her head, her blue-grey eyes, which will no doubt change colour, to her tiny little fingernails. There's also wonder in how such a small creature can consume so much milk. I'd wonder where it all went if it weren't for the fact that I see the end products in her nappies. And yep, she cries, lots, and sleeps lots except when we want her to but usually we work it out in the end. Ooops, I hear a cry that says "where's my milk!!!" so this is a shortened blog post, but we're loving it, even the mucky freaky bits.